I am a left-handed Cornishman living on the coast of South Devon. From the window I look across the water to Shaldon and the entrance to Teignmouth harbour, and south along the coast to Babbacombe and Hope’s Nose. I began this blog in 2006 because I bought a small yacht called a Folksong. I didn’t know of any other Folksong – (other than the singing variety), so I thought this would be a way of finding out more. It was and is. The yacht is called Blue Mistress. I sail out of Plymouth. 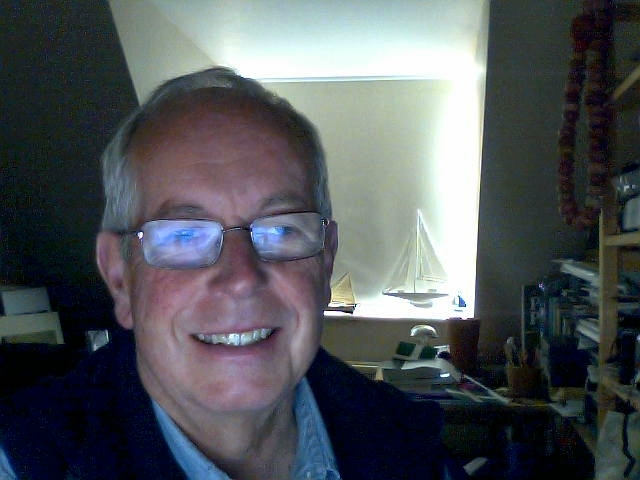 My interests are mainly nautical, focussing on single-handed sailing and the coasts and harbours of the Westcountry. I also enjoy maritime history with specific interests in the Westcountry trading ketches as well as inshore craft worldwide, including the fishing boats of the Eastern Mediterranean. Having finished a forty-year career in December 2013, I am no longer contained by the tight discipline of that career and I find myself exploring a wider, less structured world. In these unfamiliar surroundings, I am ‘edging forward‘, stretching the old boundaries, enjoying the freedom to wander. Over a lifetime, I got many things right and I made plenty of mistakes – more than I care to remember. I hope I have learnt from that experience. Now I am older, this continues at a new level – some things go right, other things wrong . . . and I am still learning. I am finding ways to write about this too – hence the reworked website. Regarding the title: My earliest memory is of looking out to sea from Steeple Point in North Cornwall. Steeple Point is where it all began for me. “Not all who wander are lost” is a quote from JRR Tolkien. I am thrilled to discover a picture of my Great grandfather’s boat in your collection. If you get in touch via email, I can give you more information. I have just discovered your blog, by chance in search for information about folkboat-types similar to mine. I wanted to tell you how much I am enjoying the beauty of texts and images, and admiring the clarity and coherence of purpose. I wish best luck in that “streching the boundaries”, and hope to come back here often. I wish you best luck in that “streching the boundaries”, and hope to come back here often. Hi Bill – excellent blog – is there a way of getting in touch directly?